When I first saw the new trailer for Grand Theft Auto V one thought immediately jumped into my mind. This looks like a current generation title. In my quest to uncover the secrets of GTA V, I asked our resident video editor Harald Schossman to create a new graphics comparison video. This video compares the graphics from GTA IV to those found GTA V. What you see in this highly revealing video might surprise you. The first thing you will notice is that the size and scale of the game is very similar to what you see in GTA IV. Character models are definitely improved in GTA V, but they are still very close to what we see in GTA IV. The same can be said for vehicle models and environments. There was a rumor that mentioned Czech developer 2k Game, creators of the Mafia franchise, is helping out with the development of GTA V. [Source] I played the game Mafia 2 and felt it was an outstanding title. One thing stands out when I see these improved character models, they remind me the character models used in Mafia 2. 2k Games does some amazing work, so if they are helping out I can only see their influence as a positive thing. Rockstar has also removed the grain filter from GTA IV. This grainy visual filter was supposed to create a more gritty, realistic looking visual style. Instead most gamers were annoyed by the feature and quickly turned it off soon after starting the game. GTA V is far more crisp and clear than its predecessor. Often times developers will use the lead version of a game when creating a trailer or a TV spot. This is an old tradition that goes back all the way to the Atari days. Many adverts for the Atari 2600 would often feature the graphics of the superior Atari 5200 version. Of course there would always be a small disclaimer at the bottom of the screen. No matter what the case, this tradition continues to this day, and that raises another interesting question. Which version of the game are we seeing in the GTA V trailer? Is it the Xbox 360 version? The PS3 version? Or stranger yet, could it be the Wii-U version? Rumors of a Wii-U version began a few weeks ago when an industry analyst claimed Rockstar was delaying the game to avoid clashing with the release of the next Call of Duty and Assassin's Creed titles, while "waiting for a larger installed base of the Wii-U." [Source] Obviously this statement caused quite a stir. 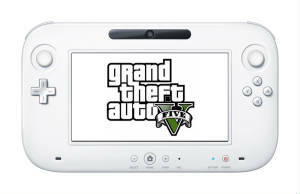 The prospect of a GTA game on Nintendo hardware was pretty surprising. However things really get interesting when you couple this statement with rumors about the hardware prowess of the Wii-U. About The Author: E.Thomas is obsessed with Rockstar Games. Over a half million people have watched him play GTA San Andreas on our original, underground YouTube Channel. He can usually be found wandering the streets of Hollywood, telling people that CJ is a busta. About The Editor: Harold Schossman is our International News Correspondent and our resident Expert Videographer. He has worked in the entertainment industry for almost two decades. Be sure to check out his outstanding video work on his YouTube account.